About a week ago, Isla had her first temper tantrum. It was rather crazy and dramatic. Ian told her no to something she was doing in the bath and she proceeded to throw herself backward (thankfully Ian caught her) and scream and cry. DRAMA. This whole throwing herself back and screaming over things has become a bit of a trend since then. Anytime she has to do something she doesn't want to do, she does it. Most the time it is predictable - diaper changes, getting dressed - but sometimes she does it randomly like when I set her down or something and I am not prepared, so she hits her head, thus taking the situation to a whole new level. And to think I thought I still had time until the drama came! I was trying to think of things that are Isla's favorites, but I don't think she really has any favorites. I can tell you what she doesn't like though. She HATES things being put over her head, so getting dressed is a bit of drama. And she dislikes diaper changes as well. Oh, and she screams pretty much any time she goes in her car seat these days, but once we are driving, she is fine. But really, I lied. Isla does have favorites. She loves dogs and constantly tries grabbing them. She also loves being all up in Connor's business, which of course causes drama. She loves being able to feed herself real food (aka: not pureed) and is down with pretty much any food that she can feed herself. And she loves crawling around the house after me...and stopping to play with the door stoppers. Those door stoppers are so fascinating to youngsters these days! Connor loves them too...well, loves taking them off anyway. As for toys, she really loves whatever Connor is playing with. Also, anything she can hit together and make noise, so wooden blocks are a hit. Isla has been trying hard to copy what we are saying. She will copy sounds like kisses and blowing raspberries. But she also tries to copy what you say if you say it to her over and over. I am thinking she will be talking way before Connor was. Sleep wise, Isla has been up and down...and pretty much all around. She was only waking once a night. Then went back to waking numerous times a night. And now is back to waking once a night, which is really early in the morning, so I guess technically she is sleeping through the night. I can't wait until it is consistent though. She seems to thrive on consistency and that has been difficult with everything going on lately. And generally, with her sleep all messed up, I am the one that has to pay for it. That little toothy grin melts my heart every time I see it. And those eyes, people are always complimenting Isla on her eyes. And random people are constantly telling Ian to buy a shot gun. I kid you not, last Saturday we were told that by numerous strangers. Its funny. Ohhhh girl drama begins!! Ughh!! It's a good thing she is seriously cute. 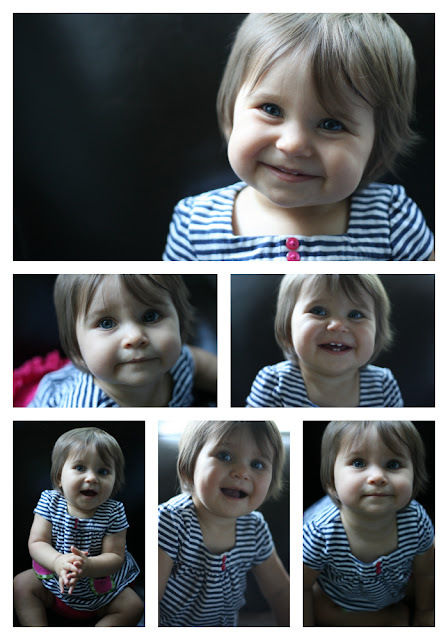 That first picture of her smiling ...ADORABLE ADORABLE!! and 10 months... ummm you just did her 9 month where is time going?!?!? That's how I feel, but I've come to terms with the fact that she will just keep growing! Maybe. I completely sympathize with you. Abigail takes her bucket and throws water at you when you wash her hair in the tub...a bit revengeful for such a little tike. Girls are funny- the emotional strain of drama... What a cute family you all are shaping up to be ;) your kiddos are so cute! Keep on keeping on, Mama!